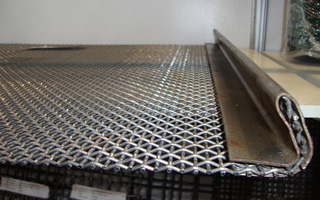 Crimped Wire Mesh is composed of two pre-bent into a wave shape to plain woven wire made of metal wire in advance due to bending mold, it can wire in two directions relative to the correct location, thus ensuring that such networks the mesh size is absolutely straight, the web woven by this form is generally used confrontational strong, relatively easy to damage, heavyweight mechanical protection, construction and operation of machinery protection. Secure high-performance, according to the relative needs of selected material production, such as stainless steel, so that acid, alkali, corrosion-resistant, used in paper and chemical companies, a stable mesh size, by the need for solid materials, sub- grade filter, liquid filter users. Material: stainless steel wire, iron wire, steel wire.